Death of judge B H Loya needs to be probed at the highest level of the Supreme Court: Rahul on one of the points likely raised by SC judges. #Congress president Rahul Gandhi speaks on Supreme Court judges vs Chief Justice. Congress president Rahul Gandhi speaks on Supreme Court judges vs Chief Justice. For the first time ever in India, four senior judges of the Supreme court addressed the media at the residence of J Chelameswar. The other three judges who accompanied him are: Ranjan Gogoi, Justice Madan B Lokur and Justice Kurian Joesph. 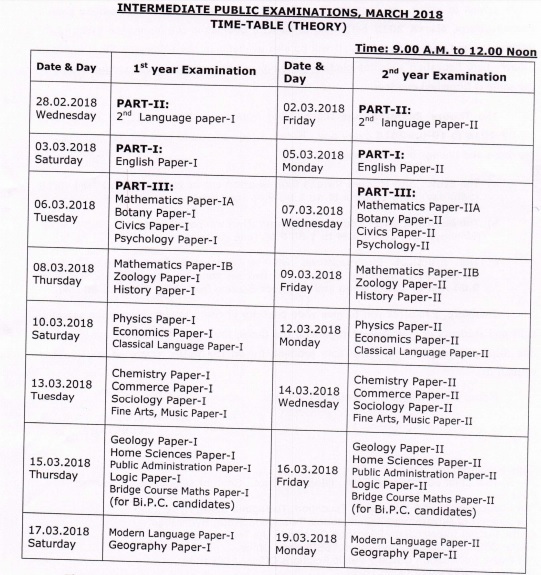 Telangana, Jan 12: The Telangana State Board of Intermediate Education (TSBIE) on Friday released the date sheet of class 12 board exams 2018 on its official website bie.telangana.gov.in. The board exams for Intermediate first year and second-year students will begin from February 28, 2018. The board exams will begin from 9 AM and continue until 12 noon. The practical examinations will be conducted from February 1 to February 21, 2018. The practical exams will be conducted on Sundays as well in two sessions. The morning session will be conducted from 9 AM to 12 noon and the evening session will be conducted from 2 PM to 5 PM. New Delhi, Jan 12: The Congress party on Friday said it was “very concerned” about the matter of four senior Supreme Court judges going public with complaints against the functioning of the Supreme Court. In a tweet, the Congress party said the development implies “democracy was in danger”. “We are very concerned to hear 4 judges of the Supreme Court expressed concerns about the functioning of the Supreme Court. #DemocracyInDanger,” the Congress made a post on its official Twitter handle. Senior lawyer and Congress leader Kapil Sibal will meet party president Rahul Gandhi over the press conference by four Supreme Court judges. In an unprecedented press conference earlier on Friday, the four judges- Justices Madan B Lokur, Kurien Joseph, Ranjan Gogoi and J Chelameswar– said that “things are not in order” at the Supreme Court. Addressing the media, the senior-most judges launched a sharp attack on Chief Justice of India Dipak Misra for “ignoring the concerns voiced by them”. The four judges did not refer to any particular matter the Chief Justice had decided in assigning benches. Asked specifically if they were upset over reference of the matter seeking a probe into the suspicious death of Special CBI Judge Brijgopal Harkishan Loya, Justice Gogoi said: “Yes.” But in the seven-page letter, they said they were not mentioning details only to avoid embarrassing the institution because “such departures have already damaged the images of this institution to some extent”. Justice Chelameswar told the media that they were “convinced that unless this institution is protected and maintain its requirements, democracy will not survive in the country or any country. “For the survival of a democracy, it is said… the hallmark of a democracy is independent and impartial judges.” Justice Gogoi said they were “discharging debt to the nation that has got us here”. नई दिल्ली| भारतीय न्यायिक इतिहास में एक अभूतपूर्व और असाधारण घटना के तहत सुप्रीम कोर्ट के चार सेवारत न्यायाधीशों ने शुक्रवार को एक संवाददाता सम्मेलन किया और आरोप लगाया कि सुप्रीम कोर्ट की प्रशासनिक व्यवस्था ठीक नहीं है. सर्वोच्च न्यायालय में वरिष्ठता के आधार पर दूसरे नंबर के न्यायाधीश न्यायमूर्ति जे. चेलमेश्वर के आवास पर जल्दबाजी में बुलाए गए संवाददाता सम्मेलन में न्यायाधीशों ने कहा कि यह भारतीय न्याय व्यवस्था, खासकर देश के इतिहास और यहां तक कि सर्वोच्च न्यायालय के लिए एक असाधारण घटना है. हमें इसमें कोई खुशी नहीं है जो हम यह कदम उठाने पर मजबूर हुए हैं. न्यायमूर्ति चेलेमेश्वर ने इस बात का खुलासा नहीं किया कि वे लोग किस चीज से नाराज हैं. लेकिन उन्होंने कहा कि मीडिया में बहुत सारी चीजें लिखी जा चुकी हैं और यह कोई राजनीति विवाद नहीं है. आखिर वास्तव में मुद्दा क्या है? न्यायमूर्ति चेलमेश्वर ने कहा, “कुछ महीने पहले, हम चारों वरिष्ठ न्यायाधीशों ने प्रधान न्यायाधीश को एक हस्ताक्षरित पत्र लिखा था. हम एक विशेष चीज के बारे में चाहते थे कि उसे विशेष तरीके से किया जाए. यह हुआ, लेकिन इससे कई सवाल भी खड़े हुए. न्यायमूर्ति गोगोई ने कहा वे लोग देश के प्रति अपना कर्ज उतार रहे हैं.